Listen to "Waiting for Snow in Havana: Confessions of a Cuban Boy" on your iOS and Android device. A childhood in a privileged household in 1950s Havana was joyous and cruel, like any other-but with certain differences. The neighbor's monkey was liable to escape and run across your roof. Surfing was conducted by driving cars across the breakwater. Lizards and firecrackers made frequent contact. Carlos Eire's childhood was a little different from most. His father was convinced he had been Louis XVI in a past life. At school, classmates with fathers in the Batista government were attended by chauffeurs and bodyguards. At a home crammed with artifacts and paintings, portraits of Jesus spoke to him in dreams and nightmares. Then, in January 1959, the world changes: Batista is suddenly gone, a cigar-smoking guerrilla has taken his place, and Christmas is cancelled. The echo of firing squads is everywhere. And, one by one, the author's schoolmates begin to disappear-spirited away to the United States. Carlos will end up there himself, without his parents, never to see his father again. 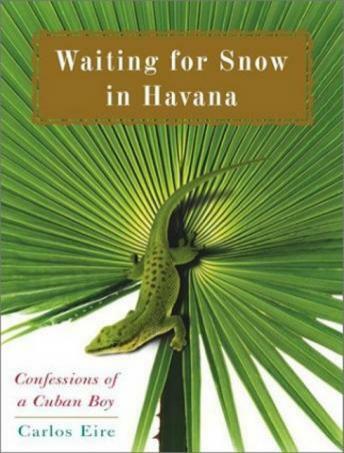 Narrated with the urgency of a confession, Waiting for Snow in Havana is both an ode to a paradise lost and an exorcism. More than that, it captures the terrible beauty of those times when we are certain we have died-and then are somehow, miraculously, reborn. This book is the true story of a boy who left Cuba without his parents at the age of 11 (in the 1960s). He came to America via The Peter Pan Project where the Catholic church got children out of communist Cuba. It is a great story, written well, with excellent narration.